Indie, which is short for “independent”, refers to a game made by one person or a small team, especially one without financial support from a publisher. This means that unlike the big-budget titles made by the top developers, indie games are made by people working on their own dime. While some of these projects obtain help from crowd-funding sources such as Kickstarter and Indiegogo, usually it’s still not enough to cover funding expenses, not to mention costs for marketing and other assets. Your other choice is to work at a video game studio where you’ll work with a large team and receive an annual salary. This is the most common route taken by aspiring game developers because it means you’re actually getting paid for your work. Of course, working for a company means you probably won’t have the same freedom as an indie developer. That’s the thing; you can become an indie game developer whenever you want. Whatever your game development skills may be, start using them to create a game either by yourself or with a team of other developers. Anyone from students in college to people with full-time professional jobs can be considered an indie dev as long as they’re working on a game project. This is probably the biggest reason many developer are tempted to go indie. While getting paid to work on someone else’s idea at an established studio is fine, there’s nothing quite like bringing your own ideas to life. Being indie also means you get to work on your own schedule, which means no one pushing you to meet milestones, asking you to crunch for several more hours, etc. 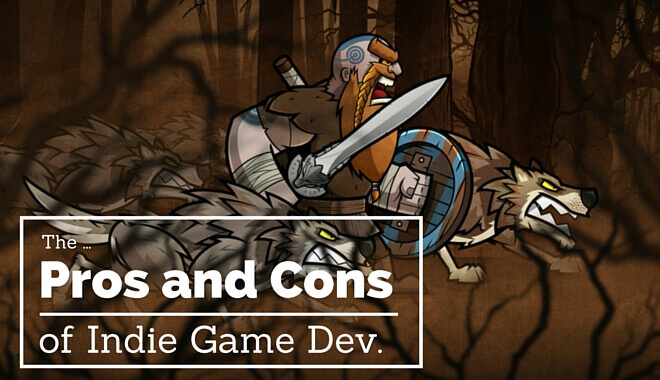 Game development, even small projects, are costly and time-consuming endeavors. Indie developers have to figure out how to pay for resources while also finding a way to cover their own expenses, including food, rent, and more. Since no one is paying you to develop the game, indie developers often quit when they run out of cash or can’t handle working a job by day and their game during their free time. Since most indie game teams consist of only a couple of people, chances are each person is going to be taking on more than one role. It’s not uncommon for the programmer to also help out with sound and music or for an artist to handle the marketing and promotion side of things. This means that as an indie game developer you’ll probably get valuable knowledge on different areas of game development, including art, storytelling, sound, coding, and more, all while perfectly your main talent. Some of the most captivating and innovative video game experiences have come from passionate and dedicated indie developers. So to say that small game projects can’t be good is a lie. However, as an indie developer you’ll never get the chance to work on the biggest projects in the industry. One of the coolest things about working at a game studio is helping to create huge titles that really push the limits of their respective platform, all alongside a strong team of fellow developers. There’s certainly strength in numbers when it comes to game development. Which Is Better: Indie or Studio? Neither is necessarily better than the other; it all depends on the individual. Independent game development is for those who want total creative freedom, even if it means no guaranteed paycheck and extra long hours working during their free time. If you’d rather get an annual salary and work with a big team of people, even if your own game ideas may never be used, then working at a game studio is the better choice.